If you can’t get up from bed and sit in front of your computer to blog, WordPress.com has the perfect solution for you. 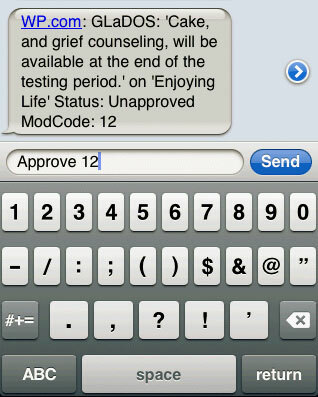 You can manage your blog using SMS messages, via new 77377 (PRESS) shortcode. Life cannot get easier than this… isn’t it? Protect your blog by using a two-step login process. A text message will be sent to your phone upon login with a passcode that must be entered in order to access your Dashboard. Get notified of new comments and moderate them on the spot with a simple text reply. You can also send in a reply to comments you receive. Get a notification when a post is published on your blog. Need to post something short and sweet right away? You can fire off a text and a new post will be added to your blog instantly. The upgrade is available for just $20 per year. To purchase, select “Upgrades” while on your blog Dashboard and then select “Text Messaging”. Note: Currently available in the USA only. Standard text message and data rates apply. Ready to get started? From your dashboard, click the “Text Messaging” link under the “Settings” tab to register your phone number with the service. After activating, you can select the Text Messaging features that you would like to use for your blog.